Beautiful pastoral shot! I know very similar place. Very clever way of using the cow to focus attention further into the scene (the house). I would have cropped a bit different so that the cow is not dead centre, but admittedly sacrificing a lot of the beautiful scenery. Excellent! Fantastic details ! Excellent capture !!! Hey, even this cow is saying.... "Go away Winter! I'm ready for some warm weather & skinny dipping!" Fantastic!!! The alndscape is remarkable enough but something about that cow..... that cow really makes the picture! You certainly have the eyeand talent with cameras. This is a beutiful scene. 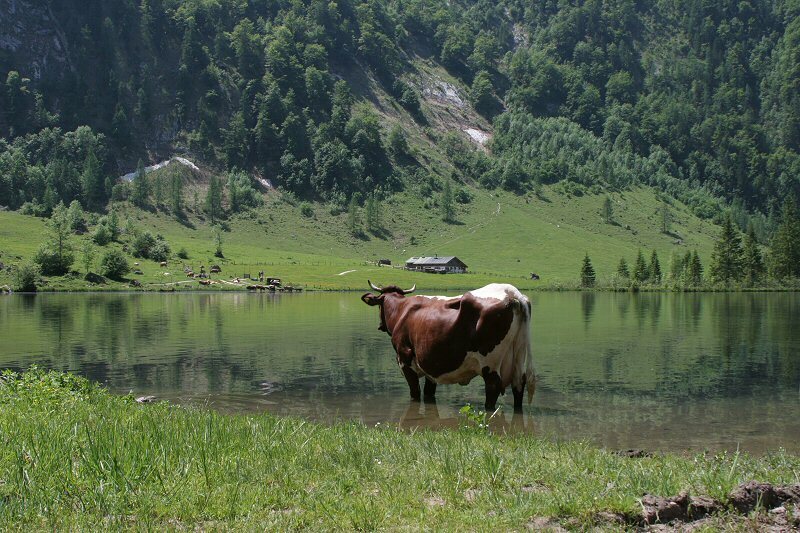 this cow for sure lives in a special place... the scene you've captured is a dream! Love the "Lady in the Stream". Wonderfully calm and inviting. What a fantastic shot. Gorgeous landscape and you captured a beautiful and quiet scene. I like it!!! Very good ! Now, tell me, do I see (and the cow also) 3 cows on the other side of the lake ?